This will be a complete beginners guide to setting up a Minecraft server on your computer. 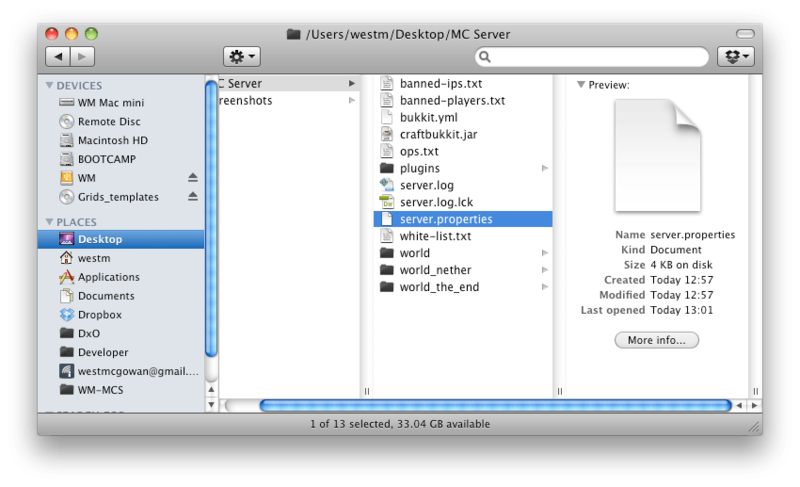 I’m using OSX so it will be a little different for Windows/Linux users. What you first need to do is to get the latest version of Bukkit. It’s just the server software. It’s very user friendly, so modding your server should be really easy. Get Bukkit from here. Just look under Recommended Builds on the right. 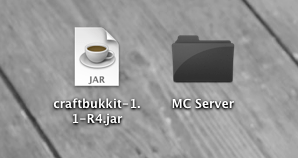 So now that you have Bukkit, your going to want to create a new folder and place Bukkit inside before you open it. Don’t open craftbukkit.jar just yet. Theres still a few things left to do. Open server.properties with TextEdit. Above are my settings for a basic SMP. The options are very straight forward, just do a quick Google if you get stuck. Once this is sorted you’ll need to create a server star command. Which is probably the hardest part of making a server, but it’s still really simple. The –Xmx2560M is the amount of RAM allocated to the server. Change depending your system. I’m using a late 2009 2.5 Mac mini with 8gb of ram, so using 2gb (2560) isn’t really too much of a big deal. Next you need to open up Terminal (cmd+space to open up Spotlight to find it). Next type in chmod +x and don’t press enter just yet. Drag the start_server.command file into the Terminal window, then press enter. When ever you want to start your server just double click on start_server.command, and if you wish to stop your server type stop in the terminal window. If you don’t stop your server you can damage the server files, which could lead to the corruption of them. Open Activity Monitor and make sure there isn’t any processes called Java running, if there is, just quit/force quit them. Now thats the server side complete, you need to work on getting people to be able to see and join your server over the internet. 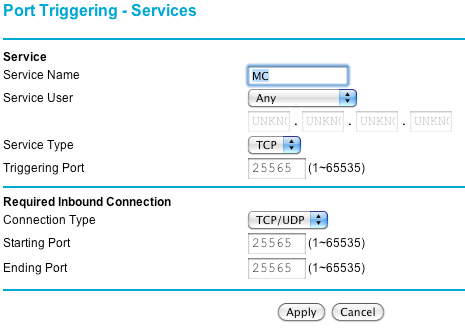 You’re going to need to set up Port Forwarding or Port Triggering for people to be able to join your server. Instructions vary from router to router so check out portforward.com for instructions for your router. You can use a cool handy piece of software called Port Map to make sure/check your ports are open. Of you like to install a plugin, you can do easily. Just download one or more from the Bukkit site and unzip (if needed) and place them in the plugin directory of your server. I recommend Dynmap and WelcomeMe.